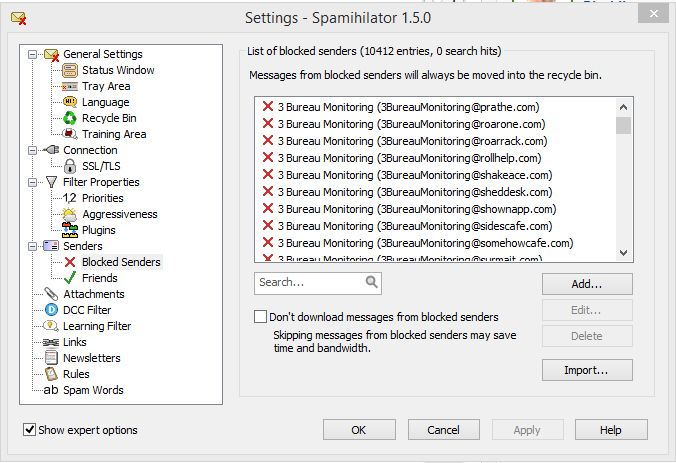 Spamihilator » Thema anzeigen - How to most effectively block? How to most effectively block? In an effort to try to block as much machine-generated spam as possible, I generally add senders to my blocked list first, then follow up by blocking the domain. It's a lot of work and I'm not sure how effective it is, in particular the "block sender" command. I find I'm still getting mail from "ch3ap_viagra@abbc.com" and "ch3ap_viagra@xyyz.com", though if I'd gotten either of those I'm sure I would have blocked both sides of the "@" separately. Thanks! Re: How to most effectively block? Thank you for your interesting notice. Could you give a screen shot of your blocked senders list? And, in code brackets, an example of such a mail? Typically, it’s not so effective to collect spam senders – except of repeted senders. Chactory hat geschrieben: Hi mulciber! Hi: Unfortunately I tried several ways to link to or attach a screen shot, and your system does not appear to permit it. Can you advise? Thank you! I was hoping to send you a better example, but perhaps I am asking the question incorrectly. I understand that spammers will generate endless numbers of new domains all the time, so that even if I block any of these domains, I am likely to get spam like this again. However, as mentioned, I am also blocking the sender. So I was assuming that, as in this case, if I blocked only the domain of "3BureauMonitoring@roarone.com" I would still get mail from "3BureauMonitoring@roarrack.com". However, in each case like this I also took the time to block the sender. So I am wondering why I continue to get spam from the sender "3BureauMonitoring@*"? Does my question make sense? Thanks again. Gast hat geschrieben: Does my question make sense? Thank you for your question. Surely it makes sense! And I fear, beyond that, it brings still new findings about Spamihilator's functionning to me. If I guess right, because I can't see the spam-mails, it depends on your giving the blocked senders a similar name. I suppose, that the spam-senders use names different from the sender's address. Thank you very much. I will study these examples and see how I can optimize my approach. I greatly appreciate your efforts!